Charles bridge is a historic bridge that crosses the Vltava river in Prague, Czech republic. Its construction started in 1357 under the auspices of King Charles IV., and finished in the beginning of the 15th century. The bridge replaced the old Judith Bridge built 1158–1172 that had been badly damaged by a flood in 1342. This new bridge was originally called Stone Bridge (Kamenný most) or Prague Bridge (Pražský most) but has been „Charles Bridge“ since 1870. 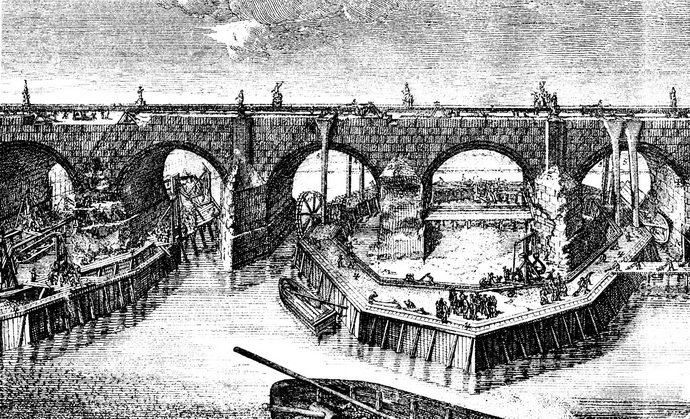 The bridge is 621 metres (2,037 ft) long and nearly 10 metres (33 ft) wide, following the example of the Stone Bridge in Regensburg, it was built as a bow bridge with 16 arches shielded by ice guards. It is protected by three bridge towers, two of them on the Lesser Quarter side and one on the Old Town side, the Old Town Bridge Tower. The bridge is decorated by a continuous alley of 30 statues and statuaries, most of them baroque style, originally erected around 1700 but now all replaced by replicas.